This has been by far the most annoying swimsuit shopping season I've ever had. I probably just need to accept that baby #3 might have permanently altered my body and make my peace! 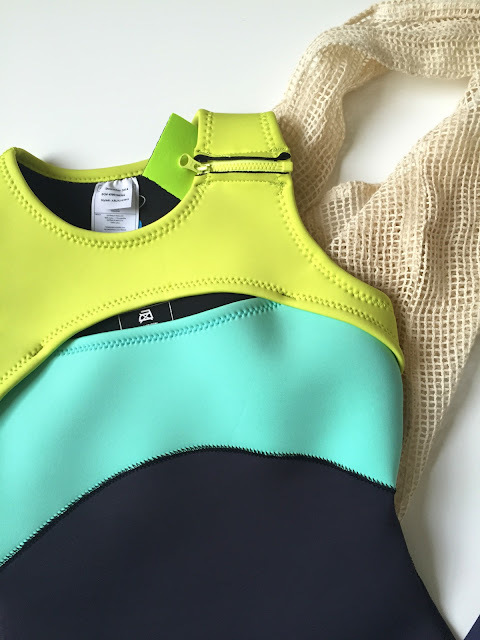 Amazon | I loved the sporty cut and was intrigued by the idea of a neoprene swimsuit. I had a gift card so I ordered it and it's a winner! The neoprene is thicker than traditional swimsuit material and really forgiving of my lumps and bumps (I also really liked the print on this one but suspected the neckline wouldn't be flattering on me). We'll see how the suit performs in the water but I can totally get behind neoprene swimsuits! Neoprene is all over the place right now!! I've been curious about it. I went swimsuit shopping last weekend, and with recent changes I've made (you know), IT WAS SO MUCH BETTER THAN USUAL. Now if only the beaches around here weren't like 40 degrees, you know?